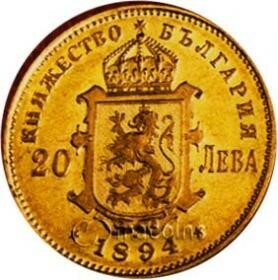 The obverse depicted Bulgaria coat of arms. On the left is the nominal value of 20 leva.In the outer circle of the coin has an inscription “Principality of Bulgaria” and the year of issue - 1894. The reverse side depicted bust of the prince Ferdinand I. Under the bust has a monogram “K.Б.” and inscription in latin “A.S”. In the outer circle of the coin has an inscription “Ferdinand I. Bulgarian Prince”. Edge: embossed text "God Save Bulgaria"
Related links to "20 leva"